Tampa to Orlando High-Speed Rail: Keeping Promises to Taxpayers? Florida's Tampa to Orlando high-speed rail project could be barreling down the tracks toward taxpayer obligations many times the $280 million currently advertised. That is the conclusion of my Reason Foundation report, The Tampa to Orlando High-Speed Rail Project: Florida Taxpayer Risk Assessment. The 84 mile, purportedly $2.7 billion project is administered by Florida Rail Enterprise (a part of the Florida Department of Transportation) and would be built by a private builder/operator selected through a competitive process. There are a number of reasons to believe that there is slim prospect of limiting the obligation of Florida taxpayer to the promised $280 million. The international experience indicates that Florida taxpayers will indeed be fortunate if the bill is only $280 million. A team led by Oxford University professor Bengt Flyvbjerg found that passenger rail systems typically have cost overruns of 45 percent. Such a cost overrun would increase the bill for Florida taxpayers to $1.5 billion. However, the capital cost overrun could be even greater. The Tampa to Orlando line cost per mile is less than half that of the first segment of the California high-speed rail line, despite factors that should make the Florida line more expensive.. In California, there is a concern that the eventual $45 billion or more required to complete the 500 mile route may not be obtained. As a result, the first segment (Borden to Corcoran in the agricultural San Joaquin Valley) is being built so that it can be used by the existing Amtrak service should the high-speed rail line not be fully completed. Thus the shorter $4.2 billion California segment excludes various elements that will need to be upgraded later for high-speed rail trains to operate. The $4.2 billion does not include the funding for trains, electric power infrastructure, train yards, train maintenance facilities and administrative facilities. More of the construction will be in agricultural and rural areas than in Florida which will tend to make the California project less costly. There will be only two "Amtrak" quality stations, as opposed to the five far more expensive high-speed rail stations on the Tampa to Orlando line. For example, Florida Rail Enterprise characterizes the potential Tampa station as having the "potential to be one of the most visible, dominant and iconic architectural features of the city." This hardly suggests a process driven by cost control. The Tampa to Orlando line does have two cost advantages relative to the California line, including that right-of-way has largely already been obtained and that there will be less construction on viaducts. These factors however, seem unlikely to compensate for the elements that are excluded from the California costs. The Tampa Orlando high-speed rail line would cost $3 billion more if its cost per mile equals that of the California segment. All of these additional costs would be the responsibility Florida taxpayers and would raise their bill to nearly $3.3 billion (Figure). There is reason to believe that the line will suffer day to day operating losses, despite claims of Florida Rail Enterprise to the contrary. Just as the international research indicates costs are often understated, ridership and revenue is often overstated. Flyvbjerg's team found that projections were, on average, 65% higher than the eventual actual ridership. If the Tampa to Orlando line were to match this average, Florida taxpayers would have pay $300 million more just over the first 10 years of operation to make up for operating losses. This would raise the bill for Florida taxpayers to $3.6 billion ($3.3 billion plus $300 million) with more likely after 10 years. The Tampa to Orlando high speed rail line may not achieve even the already discounted average ridership performance evident in the international research. This would mean an even greater revenue shortfall and more in bills for Florida taxpayers. The Tampa to Orlando line will provide virtually no intercity travel time advantage compared to the car. It will, in fact, cost more than driving. It will cost a lot more in the likely event that an expensive taxi ride or a car rental at is required the destination. Even so, the ridership projections can be characterized as stratospheric. Florida Rail Enterprise assumes two thirds of the ridership of Amtrak's Acela Express on the Northeast Corridor, despite the fact that the Acela market has eight times the population of the Tampa to Orlando market. Moreover, the Tampa to Orlando line will operate at average speeds 34 to 70 percent below that of high-speed rail trains in China, Japan and France. This is because the train will operate as a local shuttle between the Orlando International Airport, International Drive and Walt Disney World. These risks combine to threaten Florida taxpayers with many times the claimed $280 million cost, like Massachusetts taxpayers, who were forced to pay much of the $16 billion in cost overruns on the "Big Dig" highway project. The risk to Florida taxpayers would be in contrast to the billions Governor Christie is saving New Jersey taxpayers by cancelling the "Access to the Regional Core" Hudson River tunnel for which costs were spiraling, consistent with the international research. This would seem to be no time to saddle already overburdened taxpayers with additional and predictable obligations. Obviously, Florida taxpayers could be spared these risks by canceling the project. However, the lure federal funding could prove to be irresistible. If so, the state should provide ironclad provisions to limit taxpayer subsidies to the promised $280 million. The builder/operator should assume all financial risks and there should be no state financial guarantees. Further, megaprojects like the Tampa to Orlando line can be "too big to fail," and it could be nearly impossible to stop construction once it is started, even as costs balloon. Thus, only the independently operable Orlando tourist shuttle segment (Orlando International Airport to International Drive and Walt Disney World) should be initially built. The extension to Tampa could be built later in the unlikely event that there is enough left of the $2.7 billion. These decisions will soon be made by newly elected Governor Rick Scott, whose has stated that his evaluation will be driven by the impact on Florida taxpayers. Doc Dockery, former chairman of the now-defunct Florida High Speed Rail Authority and financier of a now repealed constitutional amendment that required building high speed rail has "pooh-poohed" the risk of cost overruns, noting that the Florida Department of Transportation "has said repeatedly" that any bidder must "give a fixed price. This means no cost overruns." He continues, "how can this be more plainly stated?" Regrettably, the experience reveals the rhetoric to fall far short of what is required to protect taxpayers. If construction proceeds, the Governor and state will be exposed to an over-whelming challenge to keep the $280 million promise to taxpayers. If they succeed, it will be a first. Chances are they won't. 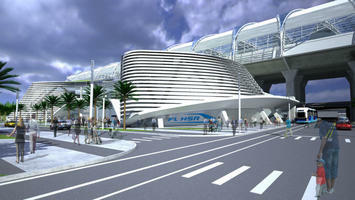 Photo: Concept for "iconic" Tampa station. Available at floridahighspeedrail.org. Submitted by davebarnes on Mon, 01/17/2011 - 17:50. I do not understand how ANYONE is going to choose this choo-choo over their car. Will cost you more in money. Will take longer point to point. It is a relatively short drive in a car so driver exhaustion is not an issue. If this boondoggle ever gets constructed, my prediction for ridership is fewer than 100 people/day. Submitted by J Hoff on Wed, 01/19/2011 - 09:10.